Selling is a Mindset and it is something that any of us who want to achieve progress must do. But one thing is a constant. That you will be successful in achieving your outcome. In other words, think of it like this. 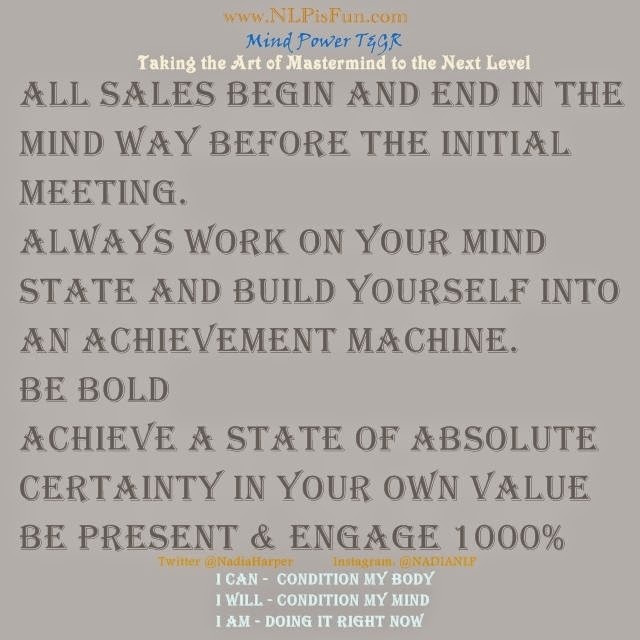 All Sales Begin and end in how you program your own mind for your success. With this being said, if you want "Yes Tickets" of any kind, in any form. You must become the master of your own mind. Your unconscious processes are predicting your behavior and of course your results. NLP is about restructuring your unconscious processes to work on your behalf. Program your mind then just as a Mind builder would. 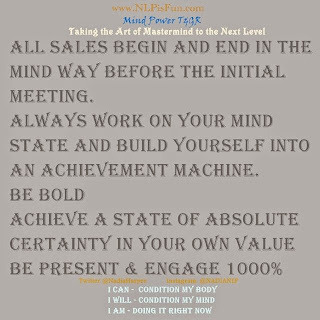 Be relentless in giving yourself the NLP advantage in resilience and Self mastery. When you want to sell anything you must have already been well rehearsed in your NLP mental drills. This affects your unconscious processes as you have trained your mind to act in your favor. This is why learning self hypnosis and NLP are so valuable. Yes it is true that you will be able to influence other people and more importantly you will be able to influence yourself into high gear and tenacious action first.